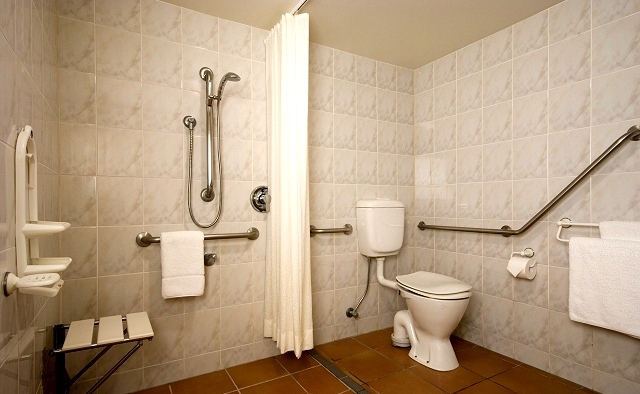 Specially designed bathrooms for the disabled help to provide a way for those who are less mobile to retain their independence and to enjoy maximum safety in a residential setting. often prove to be obstacles to comfortable accessibility. environment that promotes a large degree of independence. near a shower or tub, you can easily provide safety measures for anyone who needs to be steadied from slipping or falling in the bathroom area. providing a warm room during bath time. If you only need to make a few changes or are going to build a whole new universal design bathroom for the disabled, here are some helpful remodeling tips about handicap fixtures, features and placements that will make your project a success. Conventional bathroom doorways are often an obstacle to good accessibility and safety. To make a simple adjustment for better accessibility, you can reverse the hinges on the bathroom entrance door, as well as the shower door, so that they swing outward. This makes it easier to help a family member if they happen fall. The best replacement hinges are those that are swing-clear hinges, which will also add extra space for door clearance. Note: More serious modifications will have to be made by widening doorways through construction methods, if you need a wheelchair accessible bathroom that accomodates standard chairs as well as speciality chairs like bariatric wheelchairs. The bathroom flooring is another important area that must be addressed, especially for safety reason. It must be non-slip and level. You can make the floor non-slip by brushing a non-slip finish over your current ceramic tile floor. This will improve the traction. You can also add non-slip adhesive strips to the tub or shower. You may need to replace your floor to make it level or for better mobility. If so, be sure to consider materials such as vinyl, cork or mosaic tiles that are matte surfaced. These materials are non-glare and non-slip surfaces. The necessary modifications or new installations to this area of the bathroom is entirely dependent on the type of disability that you need to accommodate. Obviously, considerations such as height of fixtures and open clearance under the vanity or sink area will need to be addressed if you're dealing with those who are less mobile or who are in wheelchairs. If you aren't sure about general height and clearance guidelines for bathrooms for the disabled, be sure to check the standard ADA bathroom requirements for excellent instructions. Reaching for cabinets that are improperly placed can be dangerous as well as inconvenient. If you're retrofitting a conventional bathroom, you may be able to add pull-down handles for wall mounted cabinets without having to re-position them. Pull-down handles allows the user to access the cabinets more easily. There are also magnetic latches that respond to a light push. These are extremely useful for those with limited dexterity. If these adjustments are not sufficient, it may be best to remove the cabinets completely and reposition them for convenient use. Most disabilities require some adjustments to the shower or tub area of a bathroom. There are many handicapped solutions that are available, and again, you will need to determine the need based on the type of disability. Broadly speaking, you can either choose to install a pre-fabricated handicap shower stall or a walkin tub that can make it very convenient for those with less mobility. On the other hand, you can simply retrofit a bathroom with portable mobility devices such as a portable bathtub lift without removing your existing tub. Installing proper lighting fixtures and designing good electrical placement is important. Here are some of the important fixtures for vision and for better practical usage. It is generally necessary to either install a new toilet that meets handicap requirements for best use. These are usually between 17 to 19" tall. If you don't want to install a handicap toilet or toilet bidet, you can provide a raised toilet seat that can be placed on a conventional toilet. Toilet adapters can raise the seat from 2 to 5". If needed, you can also install a toilet seat lift for superior safety and convenience. Be sure to place grab bars around the toilet area as well, or choose a raised toilet seat that also has grab bars attached. Before you tackle a completely new accessible bathroom project or a renovation project, be sure to discuss each of these issues with an experienced contractor who understands the necessities, as well as the problems associated with designing bathrooms for the disabled. Of course, if you're construction savvy, you can turn this into a DIY assignment. As always, the disability needs that you wish to accommodate will have an overall bearing on how much you spend, what types of handicapped bathroom equipment should be installed and whether or not you need professional help to complete the project successfully.